Most pooches love to have friends from the same species but that is not enough ground to assume that bringing home a new dog is going to be a cake-walk! Striking a balance between your two furry friends is important, if you don’t want either of them to feel hurt, threatened or left out. Here’s how to make things easier for both pooches. Two doggies living under the same roof (especially if one of them has been there for long enough) can lead to a complex scenario with one turning hostile towards the other or feeling insecure. But once you succeed in your endeavour to make them cool buddies, you will be pleased to see your two pooches reveling in each other’s company. Here are a few pointers to keep in mind before you make the big decision to expand the family and how to go about introducing the new pet to the old one. Understanding is the key: Don’t bring in a new dog just because you think it’s the right thing to do. Keep in mind your first one’s feelings – he may not be too keen on the idea of sharing space and your affection. Give it a second thought, if your dog is over-possessive and insecure. In case you are planning on a second dog just because the first one is old and unable to play around, it would be the worst thing you could do to a friend who has been there for you all his life. Your old friend needs special care and as a pet parent, that is the least you can do to give him his due for all the loyalty, love and friendship. Choosing the new pet: If you must bring in a second dog, try choosing one from opposite gender. Dogs from opposite sexes are less likely to be competitive and more likely to be polite to each other. Also, size them up so that one is not too small to be bullied by the other. Some breeds are inherently intolerant of canine company. Make sure you discuss these issues with the breeder or kennel owner before zeroing in on a particular breed. A dog’s personal characteristics also go a long way in determining how she would gel in with other canine inmates in a new home. The first ‘hellos’: This may be the trickiest part of all; if you get past this, pat yourself and heave a sigh of relief. Make sure the introductions take place on a ‘neutral ground’- an area that does not belong to either. When dogs are in an unfamiliar territory, they are more receptive and open to strangers because they are not worried about protecting and defending their land. Once they are well acquainted, you can gradually introduce the idea of ‘going home together’. Handling them right: If your first pooch is unpredictable and fussy, it is best to put both of them on leash and gradually bring them closer – carefully judging their individual reactions. If either of them growls or bares teeth, slow down and put it off for another time. If the tails go wag-wag, it is good news and you can let them sniff up and introduce themselves. From what I have observed over the years, grown-ups are usually softer around puppies. Make sure you encourage the older dog as she gets to know the little one. This works as a positive reinforcement as the dog is “rewarded” for being nice to the new member of the family. As much as you may be tempted, refrain from excessive doting on the pup so that your first dog does not feel hurt or left out. Personal space: Do not expect your first dog to share stuff like toys, bedding, feeding bowls, etc. 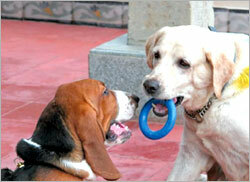 Most dogs are possessive about these things, so make sure that both have a separate set of toys and bedding. Their feeding and sleeping areas should also be kept separate at least for the first few days or weeks. Unless you are very sure of how they will behave, keep them out of each other’s reach while you are not around. Buddies: Once both dogs are comfortable with each other’s presence, they can be allowed to interact freely and play together. However, if one of them is a puppy, you may need to supervise so that she doesn’t accidentally get injured in the over-enthusiastic play. To forge a healthy relationship between your two furry friends, treat them with equal love and attention. Just like us, pooches with a social life are happier, healthier and are likely to live longer too. There are few things in life that give more joy than a double dose of doggie love and seeing your beloved pet in the company of a new-found friend.